Good morning. Here is an updated look at the visible solar disk on Monday. Solar activity declined to very low levels this morning. Region 2157 in the southwest quadrant continues to decay as it approaches the west limb. In the northwest quadrant, region 2158 is stable as it also turns towards the west limb. All other visible numbered regions are quiet and not considered a threat for strong solar flares. No Earth directed coronal mass ejections were observed during the past day. The anticipated coronal mass ejection (CME) generated by the X1.6 solar flare on September 10th swept past Earth at 15:55 UTC. Solar Wind speeds as measured by the ACE spacecraft increased from 433.2 km/s, to 671.8 km/s. A Geomagnetic Sudden Impulse measuring 43 nT was detected by the ground based magnetometer in Boulder, Colorado. Moderate G2 level geomagnetic storming is now being observed at high latitudes. Strong G3 level storming will remain possible as we head into tonight. More to follow. UPDATE: Solar wind speeds have picked up considerably and is now nearing 800 km/s. The Bz component of the interplanetary magnetic field (IMF) was tipped south, but has since turned back north. More fluctuations are to be expected during the next several hours. Visual aurora will be likely across northern Europe and Scandinavia, and if conditions hold our for a few more hours, Canada and the northern tier USA could see some activity as well. On the HAM Radio front, 6 meters (50mhz) is now alive with aurora signals as radio amateurs at higher latitudes point their antennas to the north and make radio contacts via the auroral curtain. PAUL A. LaVIOLETTE, PH.D, is author of Secrets of Antigravity Propulsion, Subquantum Kinetics, Earth Under Fire, Genesis of the Cosmos, Decoding the Message of the Pulsars, Galactic Superwaves and their Impact on the Earth, and is editor of A Systems View of Man. He has also published many original papers in physics, astronomy, climatology, systems theory, and psychology. Video of 'fireball' witnessed over California! 9/12/2014 @ 6am Pacific. Here is the AA space weather update for the morning of September 11th. An updated CME prediction model released by the NOAA Space Weather Prediction Center is calling for the plasma cloud generated by the X1.6 solar flare to impact our geomagnetic field by Friday. A moderate to major (G3) geomagnetic storm watch is now in effect. Solar wind speeds are predicted to reach near 800 km/s and could add fuel to another geomagnetic disturbance already in the forecast resulting from an earlier M4.5 flare and CME event. Sky watchers at middle to high latitudes should be alert this weekend for visual aurora displays. Solar activity during the past 24 hours was strong. The largest and most noteworthy event was without a doubt the long duration X1.6 solar flare observed around region 2158 at 17:45 UTC. The flare was associated with Type II (3750 km/s) and Type IV radio emissions, a 10cm Radio Burst (TenFlare) lasting nearly an hour and measuring 1300 solar flux units, along with a full halo coronal mass ejection (CME). The majority of plasma appears to have a northward trajectory, however a still significant portion looks to be on line with our planet. Minor (G1) to major (G2-G3) geomagnetic storming will be possible within 24-48 hours thanks to this CME, in conjunction with an earlier CME associated with the M4.5 flare on Sept 9. Another isolated moderate to strong solar flare will remain a possibility today with regions 2157 and 2158 being the most likely source. All other visible sunspots are currently stable. A new sunspot in formation is now turning into view off the east limb, but is not yet considered a threat for strong solar flares. Energetic protons streaming past Earth remain above the minor (S1) radiation storm threshold this morning. 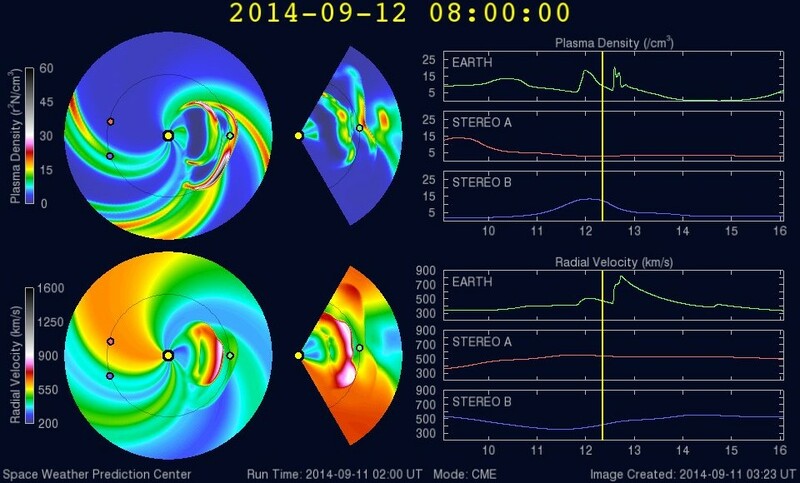 These levels could persist until the expected passage of the CME events of Sept 9 and 10. Stay tuned to our solar activity page for the latest information.